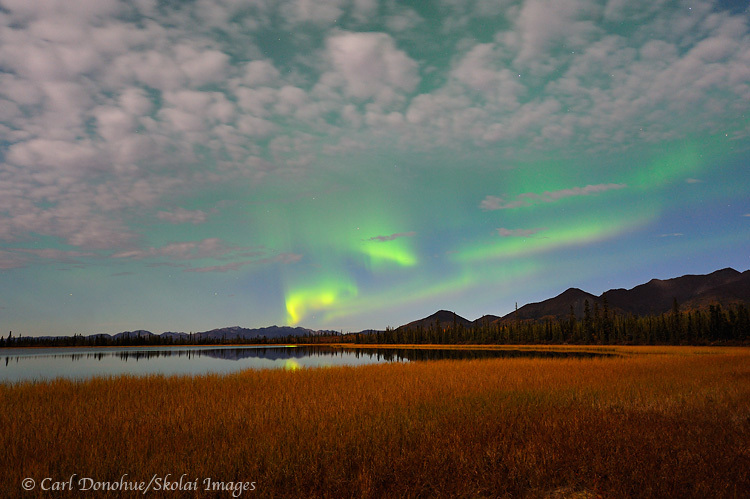 Northern lights over the Mentasta Mountains, tundra, boreal forest and a small kettle pond on a moonlit night. 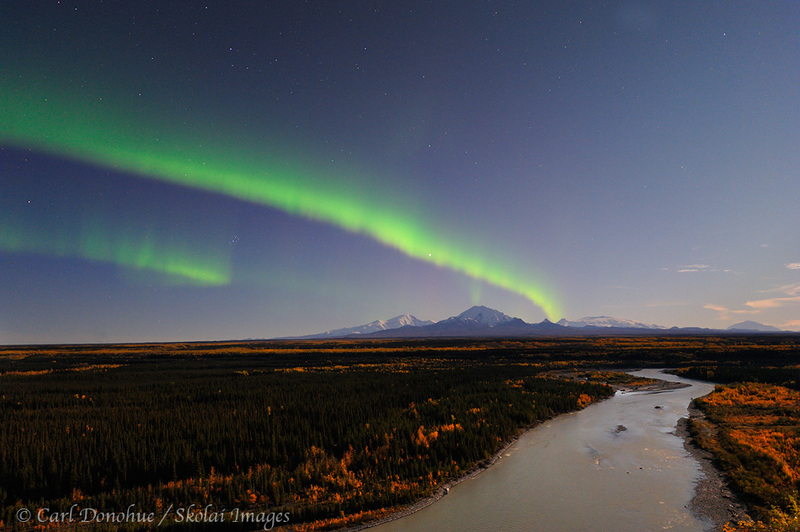 Wrangell - St. Elias National Park and Preserve, Alaska. Please click on the image above to view a larger version of this photo. 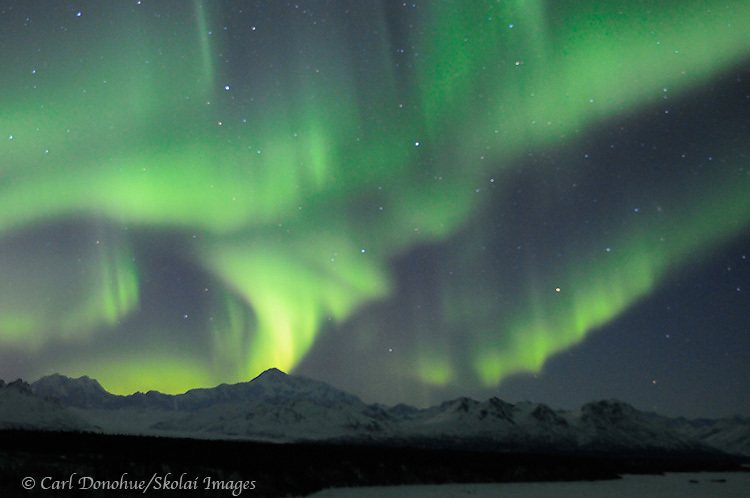 From the recent trip to shoot the northern lights in Wrangell – St. Elias National Park. I’ve never seen clouds move in quite so quickly as they did this particular evening. I’d se up to shoot over in the Glennallen area, and before long, high clouds rolled in from the southwest. In order to keep shooting, I had to figure which would be the best direction to head. I chose north and east, toward the Nabesna Road, partly because I wanted to be in that area for sunrise. So I spent the evening trying to stay ahead of the lights and catch what images I could along the way. Finally, I made it to where I wanted to be, and then set off to find a composition I wanted. For any Alaskans out there, or anyone else who’s hiked over muskeg before, you’ll appreciate this one. 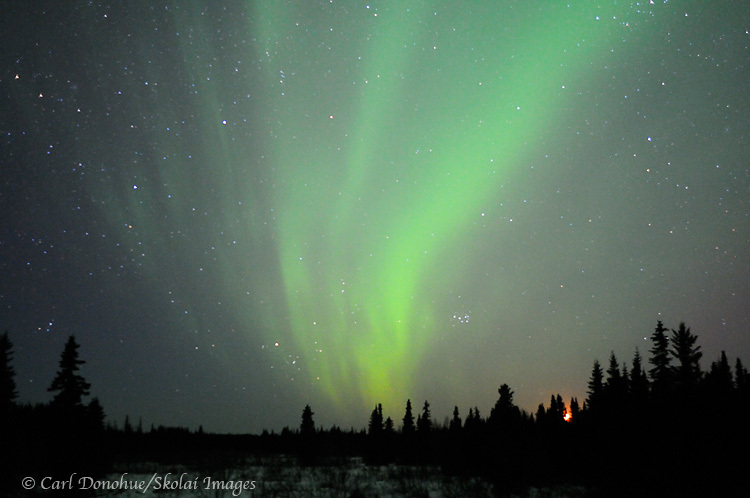 ; try setting out at night time to hike over the muskeg for your photos. I guarantee that WILL kick your a$$. Then I spent the rest of the evening waiting for the lights to turn on. They popped out a few times, but never really strongly, though they were pretty active. The full moon made for plenty of light for the foreground. I wish I could’ve gotten a little closer to the water’s edge here, but all that long grass in the foreground sits in about 10 inches of water. If the lights had offered something really dazzling, I might have ventured out, but for staying dry and warm seemed a better option given the circumstances. Finally I fell asleep under a spruce tree, woke up to a clouded sky, and stumbled my way backward camp and my superwarm, absolutely amazing, Western Mountaineering Lynx sleeping bag. life was good. I didn’t get up for sunrise. This entry was posted in Adventures, Alaska, Fall, Landscapes, Musings, Northern Lights, Photo Tours, Wrangell - St. Elias National Park and tagged aurora borealis, Northern Lights, scenics, Wrangell - St. Elias National Park on September 27, 2011 by Carl D.
This entry was posted in Adventures, Alaska, Fall, Landscapes, Northern Lights, Photo Tours, Wrangell - St. Elias National Park and tagged aurora borealis, Copper River, Mount Drum, Mount Sanford, Mount Wrangell, Mount Zanetti, Northern Lights, scenics, Wrangell Mountains on September 13, 2011 by Carl D.
Aurora borealis lights up the winter night sky over Mt McKinley, highest mountain in North America, also called Denali. Viewpoint from Denali State Park, Alaska. Click on the image above to view a larger version of this photo. One topic I’ve often heard discussed relating to nature and outdoor photography pertains to the value of the experience itself. Does photography “get in the way”, and limit the photographers’ realization of the experience itself, or does it add to it? This entry was posted in Adventures, Alaska, Art, Cool stories, Denali National Park, Landscapes, Musings, Northern Lights, Photography and tagged Art, aurora borealis, Northern Lights, Photography on March 21, 2011 by Carl D.
Aurora borealis and setting moon, in the Waxing Crescent phase, light up the winter night sky, Alaska. To view a larger version of this photo, please click on the image above. Just a quick shot from last night’s Aurora. It wasn’t the greatest Aurora, but any aurora is a treat to witness. Here I managed to capture the slowly sinking moon, in the Waxing Crescent phase, before it disappeared beneath the horizon. One piece of advice I’ll offer folks visiting Alaska to see/photograph the aurora – don’t drive around Alaska at night with under a half a tank of gas. And remember to bring a warm sleeping bag and sleeping pad in your vehicle. 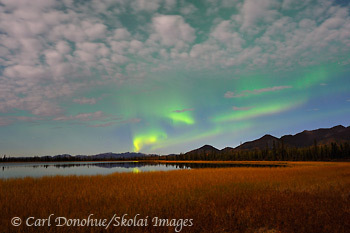 This entry was posted in Adventures, Alaska, Musings, Northern Lights, Winter and tagged aurora borealis, Northern Lights, scenics, Winter on March 10, 2011 by Carl D.
The aurora borealis (northern lights) light up the night sky and a reflection glows in the lake in the Mentasta Mountains, boreal forest, Wrangell – St. Elias National Park and Preserve, Alaska. Please click on the image above to view a larger version of the photo. 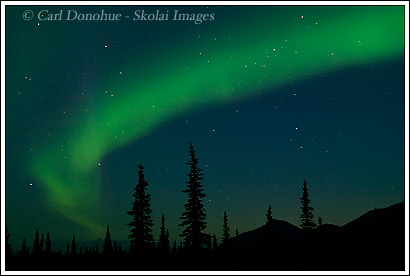 Here’s another northern lights photo. This one I tried my darndest to catch the reflection in the foreground, but the slight breeze thwarted my every effort. 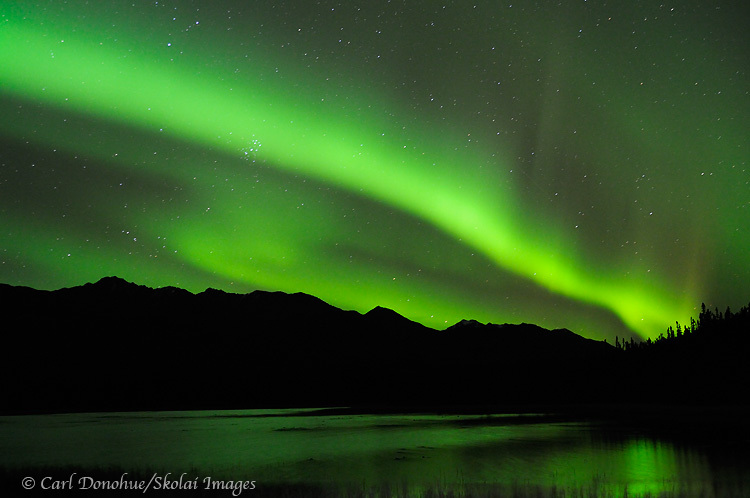 I’m seriously considering buying the Nikon 24mm 1.4 lens, specifically for northern lights photos. The difference in shutter speed with that lens, versus using a 2.4mm lens, is enormous. 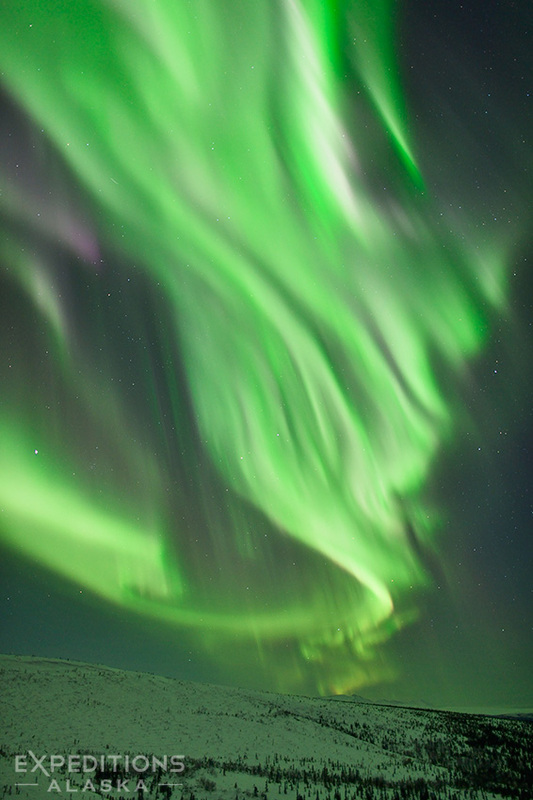 For example, this northern lights photo was taken at f.28 and a shutter speed of 25 seconds. That means after the exposure, is then need to let the camera effectively take another 25 second exposure for noise reduction .. meaning the total time elapsed is 50 seconds. That’s a lot of time to be not shooting. it also means, with that long exposure, the lights tend to wash out a little, and lose definition that comes with a faster shutter speed. 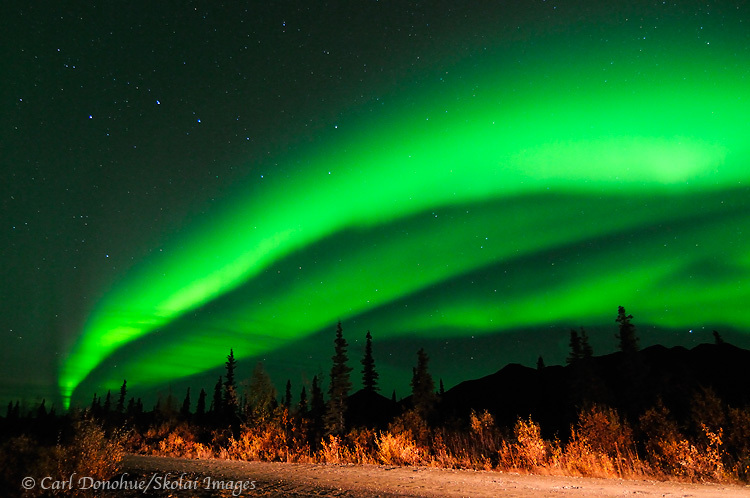 This entry was posted in Alaska, Northern Lights, Photography, Wrangell - St. Elias National Park and tagged aurora borealis, Nikon, Northern Lights, Wrangell - St. Elias National Park on November 2, 2010 by Carl D.
A new day on the way. 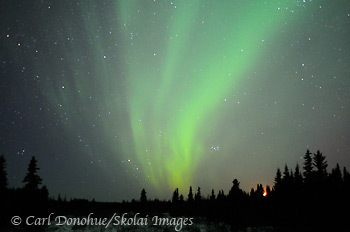 This entry was posted in Alaska, Art, Cool stories, News, Northern Lights, Rants, Wrangell - St. Elias National Park and tagged Art, aurora borealis, National Park, Northern Lights, Winter, Wrangell St. Elias on November 10, 2008 by Carl D.